Any travel photographer can attest to the fact that hidden gems and curious corners can be found just about anywhere. Unfortunately, our cameras have physical restrictions preventing them from going in certain environments. For many years, lakes, oceans, and rivers have been effectively inaccessible to the average photographer. With about 72% of the Earth covered in submerged, that rules out a significant portion of the interesting subject matter the world has to offer. However, thanks to considerable strides in technology, we have reduced the limitations underwater cameras face. 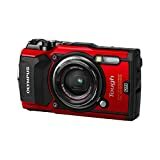 For the first time, advanced waterproof cameras are readily available at consumer friendly prices. Think that adding an underwater camera to your repertoire is sure to break the bank? Think again. 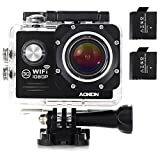 Available for Out of stock, the Aokon offers just about everything you’d want in an action camera. Measuring in at just 2.33 1.61 x 1.17 inches, it’s a bit more compact than the average GoPro. But don’t be fooled by its size or price tag – the ASJ70 is capable of some pretty impressive feats. Paired with motion detection, anti-shake technology, and 12 MP resolution, it’s easy to feel confident in the image quality the Aokon delivers. As is standard with most modern cameras, it can also connect to smart devices via a WiFi connection for effortless upload and sharing. Tough enough to work at depths of 98 feet, the camera also comes with several multifunction mounts should you choose to bring it out of the water. Unfortunately, the Aokon does not offer external microphone options, severely limiting the audio quality of videos. Luckily, many divers shooting video underwater aren’t particularly concerned with capturing the prevalent white noise below the surface. A bigger issue comes in the form of overall navigation within the camera itself. With an 2″ LCD screen and very few physical buttons, making any image adjustments in the camera can be cumbersome at best. The undisputed leader in compact action cameras, the GoPro has made the adjustments necessary to fare the deep blue sea. As hard as it is to believe that a device with just one button can seamlessly capture beautiful 4K ultra HD video footage, the GoPro manages to accomplish just that. With 12 MP resolution and the ability to process RAW images, the GoPro’s image is on par with its superb video quality. Able to mount to just about anything, it’s easy to eliminate motion blur and get stable shots while in motion. Nevertheless, potential GoPro users should be aware of a few flaws in the technology before purchasing. Although the device boasts excellent image quality, it does poorly when thrown into low-light scenarios – potentially a major problem for underwater photographers. When faced with anything short of near direct sunlight, digital grain becomes very visible. Besides, the Hero 5 experiences chronic issues with poor battery life. The design of the device ironically does not allow charging on the go, as the camera must be opened up to recharge. This could potentially restrict users to local subjects if they find themselves without backups at hand. For two decades, COOLPIX has been producing compact cameras suited for just about any scenario. For users that crave adventure, the AW130 is Nikon’s answer. Functioning 100 ft underwater is just the beginning of what this camera is capable of. It’s also able to withstand falls just under 7 ft and reach temperatures as low as 14°F. As if that weren’t enough, the camera is sealed to ensure that there’s no chance of dust, dirt, or debris making its way into the inner workings of the camera. But the AW130’s durability just scratches the surface of what Nikon has to offer. This compact camera can also capture 4K Ultra HD video footage (1080p should you choose to implement the camera’s built in stereo sound). With 20 scene modes, it’s easy to compensate for nearly any situation you may find yourself in with just a simple selection. Its’ 3″ LCD screen even comes equipped with an anti-reflective coating, making it easier to shoot in bright light. Just for fun, Nikon also included a GPS, compass, depth gauge, altimeter, and water pressure reader. For those looking to control every aspect of their image, this may not be the best fit – the AW130 offers very few manual controls. However, underwater users may very well not want to waste time fiddling with their cameras. A leader in the photography industry, Canon has become synonymous with quality among image makers worldwide for a good reason. 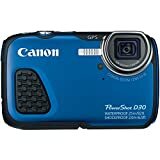 So, it should come as no surprise to learn that they’ve developed the D30 in response to similar waterproof compact cameras produced by main competitors. As is the case with many of the PowerShot line, this camera has quite a bit to offer in a small package. In particular, Canon offers a certain degree of versatility – the fixed lens has an equivalent focal length range of 28-140mm and can reach apertures as low as f/3.9. The D30 also comes equipped with 5x optical zoom complete with image stabilization, making it easy to capture subjects that may not be close by. This model has a GPS built inside as well as contrast detection technology with nine autofocus points. It remains durable – it works at depths as low as 82 feet and is marketed as temperature resistant and shockproof. As is the case with any underwater camera, testing out the device before relying on it for a once in a lifetime expedition is a must. Though the Canon has a lot to offer regarding technology, build, and image quality, those who have brought this camera to its limits underwater have noted that it’s a bit more susceptible to leaks than its competition. 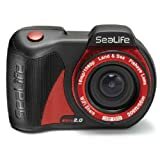 Many of the cameras included on this list aren’t specifically for underwater photography alone. After all, most of our lives happen on land, and most cameras are designed for photographing the world above the surface. The SeaLife Micro 2.0 is an exception. Designed with divers in mind, this camera produces its best work in the water. Impressively, the engineers behind the SeaLife managed to create a completely flood-proof device. Permanently sealed and void of doors and openings, those braving the water can rest easy and work with the reassurance that their underwater camera will in fact not take on water damage. Outdoing the competition in that regard, it’s able to function 200 ft underwater (that’s double what most waterproof compact cameras are capable of). But the Micro 2.0’s accomplishments don’t fall short outside of its build. It also boasts 64 GB of memory and a 16 MP Sony CMOS sensor that produces stunning results. And with a 130° fisheye lens in tote, it’s easy to capture every bit of your surroundings. Unfortunately, the camera is a bit of an awkward middle child. For those firmly invested in underwater photography, the idea of purchasing an underwater housing for a DSLR is a constant temptation that may stray potential users away from the SeaLife. As for amateur underwater photographers, the price tag is a bit much compared to some of its less capable competition. Nevertheless, this deceptively simple camera is sure to satisfy underwater photographers of all skill levels. The Olympus Tough! TG-5 certainly lives up to its name. Aside from working at depths of 50 ft, it can also withstand a 7 ft fall and keep out dust and dirt. With an anti-fog dual pane lens, it’s sure to deliver regardless of the circumstances you may find yourself in. But, we’re happy to report that the Tough is much more than just tough. As a matter of fact, it offers some pretty impressive specs. For starters, it can capture 4K ultra HD video at 12 MP resolution. It’s also capable of recording RAW imagery, unlike a fair portion of its competitors. Its fast working gears allow users to take pictures at 20 fps, and its f/2.0 lens is especially well suited for low light scenarios. The Olympus also includes some cool extras, such as a GPS navigator, a manometer, a compass, and temperature sensors. Weighing in at just 0.55 lbs, it makes for an ideal travel companion. Of course, there are a few caveats to working with the TG-5. 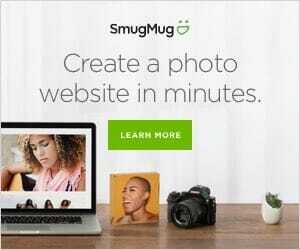 Though not a criticism of the camera specifically, a major detractor for many users lies in the fact that the Olympus proprietary RAW file format is not compatible with any of the major photo editing programs out there. What’s more, some feel that the camera simply doesn’t live up to the expectations set by predecessors such as the TG-4. The ICONNTECH brand may not have the prestige some of the other brands featured here are graced with. 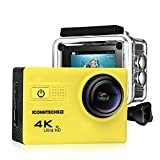 However, this little action camera is a great match for not only divers but anyone seeking to record their adventures. An alternative to the GoPro, you may very well find that this small package is capable of fulfilling all of your photographic needs. Above all, the action camera offers a surprisingly stellar image quality despite its small size. The photographs conjured by the 20 MP Sony CMOS sensor are filled with contrast and vibrant color. With enhanced noise reduction technology, the camera is ultra sensitive to light – a helpful quality when things start to get a bit dark. And, just as the name suggests, the camera captures 4K Ultra HD video, a trait that just about everyone in the market for a new camera is seeking out. However, should you decide to bring an ICONNTECH camera into your life, there are a few shortcomings that you should know of beforehand. Though it has access to WiFi connections, it’s notorious for not always functioning as smoothly as it should. Suffering from a clunky UI, navigating with the waterproof casing in place can prove to be a very real challenge. For most, these superficial issues on their own are forgivable. But in conjunction with one another, it can be tempting to forgo the inexpensive price tag in favor of a more intuitive choice. There’s a lot to take into consideration when purchasing your first underwater camera. Balancing a budget with the necessary features to shoot your aquatic needs isn’t always an easy task, with underwater housing alone frequently costing more than $1,000. These seven options only scratch the surface of what’s out there. Nevertheless, with capabilities often belying their user-friendly appearances, you work confidently with any of these devices in tow.